You can count on Action Line to go the distance at mileposts 87 and 88. So your dutiful correspondent inched along the highway just south of Home Depot to see what was afoot. We don’t call local grocery stores The City Market or The Nature’s Oasis. Nor is that big-box retailer near Home Depot called The Walmart. Not that Walmart has been entirely clear about its moniker. Up until a few years ago, it was “Wal-Mart.” Then it got all fancy schmancy. It ditched that dreadful smiley face for a giant yellow asterisk thingy, dropping the hyphenated name along the way. But Walmart’s corporate name is Wal-Mart Stores, Inc. Go figure. But don’t think Durango is in The Know when it comes to inarticulate articles. For example, take the La Platas or the El Rancho. “La” and “el” mean “the.” So what we’re saying is the the Silvers or the the Ranch. All of which has nothing to do with mileposts 87 and 88. So let’s loop back. Action Line made a circumspect circumnavigation of the greater Home Depot metroplex and came up short. Indeed, the distance between mile marker 87 and 88 is way off the mark. So there was only one thing to do: call our good friend Lisa Schwantes, spokeswoman for the Colorado Department of Transportation. Are traffic engineers designing highways with novelty fishing rulers? “Not at all,” Lisa assured with a chuckle. The compressed mile is there for really good reason. When roads are combined or when thoroughfares are realigned or reconstructed, a highway’s length can change, many times becoming shorter, she said. When this happens, the distance between “mile” markers has to be condensed. 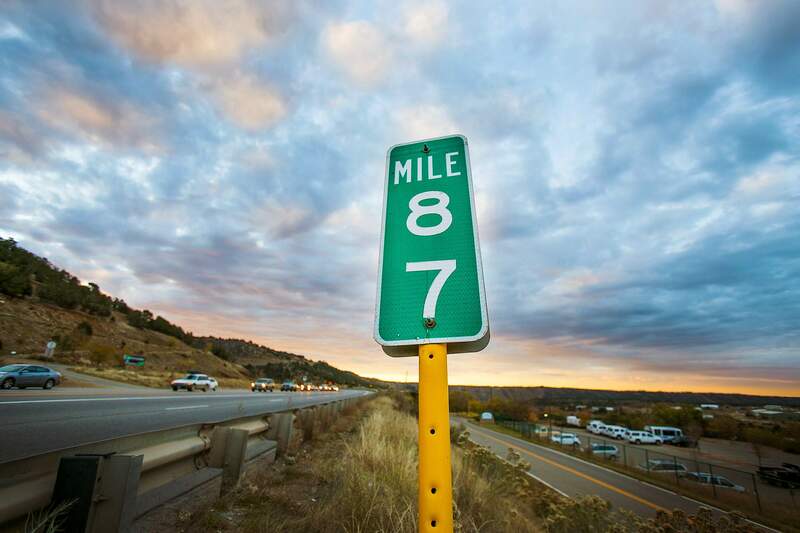 Otherwise CDOT would have to spend your hard-earned tax dollars on relocating and renumbering every mile marker across the state. Just for the record, there are 994 mileposts on Colorado’s section of U.S. Highway 160 – 497 on each side of the blacktop between Kansas to Utah. Many years ago, when U.S. highways 160 and 550 were wed, the section between milepost 87 and 88 got a haircut and CDOT called it good. Lisa said there are a several instances of abbreviated “miles” across the state. The one by Home Depot just happens to be The Doozy. So if someone asks you to walk a mile in their shoes, you could do it between milepost 87 and 88, thereby gaining very little perspective whatsoever. Add it to the list of local quirks. Durango is the Mile Shy City. Email questions to actionline@durangoherald.com or mail them to Action Line, The Durango Herald, 1275 Main Ave., Durango, CO 81301. You can ask for anonymity if you go the extra kilometer.